Natural wetlands have been used for wastewater treatment for centuries. In many cases, however, the reasoning behind this use was disposal, rather than treatment, and the wet land simply served as a convenient recipient that was closer than the nearest river or other waterway. Uncontrolled discharge ofwastewater led in many cases to an irreversible degradation of many wetland areas. Wetlands have been considered for a long time as 'wastelands', were scientifi cally neglected, and, therefore, the impact of wastewaters on different wetlands was not properly assessed. However, there has been an explosive growth of knowledge about, and a radical change of attitude toward, wetlands during the last few decades. Wetlands have been recognized as providing many benefits including water supply and control (recharge of groundwater aquifers, drinking water, irrigation, flood control, water quality and wastewater treatment), mining (peat, sand, gravel), use of plants (staple food plants, grazing land, timber, paper production, roofing, agriculture, horticulture, ferti lizers, fodder), wildlife (e.g., breeding grounds for waterfowl, preservation of flora and fauna), fish and inver tebrates (shrimps, crabs, oysters, clams, mussels), integrated systems and aquaculture (e.g., fish cultivation combined with rice production), erosion control, gene pools and diversity, energy (hydroelectric, solar energy, heat pumps, gas, solid and liquid fuel), education and training, recreation, and reclamation. Natural wetlands are characterized by extreme varia bility in functional components, making it virtually impossible to predict responses to wastewater application and to translate results from one geographical area to another. Although significant improvement in the quality of the wastewater is generally observed as a result of flow through natural wetlands, the extent of their treatment capability is largely unknown. While most of natural wet land systems were not designed for wastewater treatment, studies have led to both a greater understanding of the potential of natural wetland ecosystems for pollutant assimilation and the design of new natural water treat ment systems. 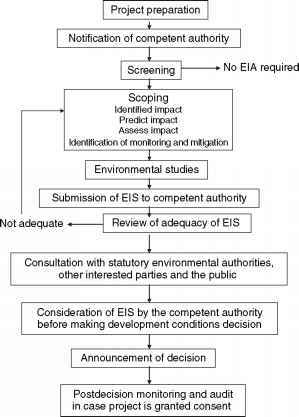 It has only been during the past few decades that the planned use of wetlands for meeting wastewater treatment and water quality objectives has been seriously studied and implemented in a controlled manner. The functional role of wetlands in improving water quality has been a compelling argument for the preservation of natural wetlands and, in recent years, the construction of wetland systems for wastewater treatment. Constructed wetlands (CWs) can be built with a much greater degree of control, thus allowing the establishment of experimental treatment facilities with a well defined composition of substrate, type of vegetation, and flow pattern. In addition, CWs offer several additional advan tages compared to natural wetlands, include site selection, flexibility in sizing, and, most importantly, control over the hydraulic pathways and retention time. The pollu tants in such systems are removed through a combination of physical, chemical, and biological processes including sedimentation, precipitation, adsorption to soil particles, assimilation by the plant tissue, and microbial transforma tions. Natural wetlands are still used for wastewater treatment but at present the use of CWs is becoming more popular and effective around the world. CW treatment systems are engineered systems that have been designed and constructed to utilize the natural pro cesses involving wetland vegetation, soils, and their associated microbial assemblages to assist in treating waste water. They are designed to take advantage of many of the same processes that occur in natural wetlands, but do so within a more controlled environment. Some of these sys tems have been designed and operated with the sole purpose oftreating wastewater, while others have been implemented with multiple use objectives in mind, such as using treated wastewater effluent as a water source for the creation and restoration of wetland habitat for wildlife use and environ mental enhancement. Synonymous terms to 'constructed' include man made, engineered, and artificial wetlands. The first experiments aimed at the possibility ofwaste water treatment by wetland plants were undertaken in Germany in 1952 at the Max Planck Institute in Plon. From 1955 Seidel carried out numerous experiments on the use ofwetland plants for treatment ofvarious types of wastewater. Although Seidel's experiments were heavily criticized many researchers continued with her ideas. In the early 1960s, Seidel intensified her trials to grow macrophytes - she planted macrophytes into the shallow embankment of tray like ditches and created artificial trays and ditches grown with macrophytes. However, Seidel's concept to apply macrophytes to sewage treat ment was difficult to understand for sewage engineers and, therefore, it was no surprise that the first full scale free water surface (FWS) CW was built outside Germany, in the Netherlands, in the late 1960s. At present, there are many different types of CWs (Figure 1). CWs for wastewater treatment may be classified according to the flow regime into surface flow (SF or FWS) and subsurface flow (SSF) systems. The FWS CWs could be further categorized according to the life form ofthe dominating macrophyte into systems with free floating, floating leaved, emergent, and submerged macrophytes. Within the SSF CWs it is possible to dis tinguish between systems with horizontal (subsurface) flow (HF or HSSF CWs) and vertical (subsurface) flow (VF or VSSF CWs). As many of these wastewaters are difficult to treat in a single stage system, hybrid systems that consist of various types of CWs staged in series have been introduced. In the European sense, hybrid CWs are usually formed by a combination of HF and VF systems. However, any types ofCWs could be combined in order to achieve better treatment performance. This article will deal with CWs with FWS. Figure 1 Classification of CWs for wastewater treatment. carbon, accompanied by resistance to degradation and low rates of decomposition of organic carbon in the oxy gen deficient water column. This high availability of carbon and the short diffusional gradients in shallow vegetated wetlands result in differences in biogeochem ical cycling compared with ponds and lagoons. Wetlands are autotrophic ecosystems, and the additional fixed carbon and nitrogen from the atmosphere are processed simultaneously with the pollutants introduced from the wastewater source. The net effect of these complex pro cesses is a general decrease in pollutant concentrations between the inlet and outlet of treatment wetlands. However, because of the internal autotrophic processes of the wetland, outflow pollutant concentrations are sel dom zero, and in some cases for some parameters they can exceed inflow concentrations. 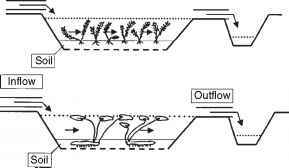 A typical FWS CW consists of a shallow basin con structed of soil or other medium to support the roots of vegetation (when rooting macrophytes are used) and a water control structure that maintains a shallow depth of water (Figure 2). Besides planted macrophytes natural assemblages of volunteer re growth from native seed banks are also in use. Flow is directed into a cell along a line comprising the inlet, upstream embankment, and is intended to proceed all portions ofthe wetland to one or more outlet structures. The shallow water depth, low flow velocity, and presence of the plant stalks and litter regu late water flow and, especially in long, narrow channels, ensure plug flow conditions. One of their primary design purposes is to contact wastewater with reactive biological surfaces. FWS CWs (sometimes also called SF CWs) function as land intensive biological treatment systems. Inflow water containing particulate and dissolved pollutants slows and spreads through a large area of shallow water. Particulates, typically measured as total suspended solids (TSS), tend to settle and are trapped due to lowered flow velocities and sheltering from wind. Most of the solids are usually filtered and settled within the first few meters beyond the inlet. While settleable organics are rapidly removed in FWS CWs by quiescent conditions, attached and suspended microbial growth is responsible for removal of soluble biochemical oxygen demand (BOD). The major oxygen source for these reactions is re aeration at the water surface. Figure 2 Types of FWS CWs. (a) With emergent macrophytes; (b) with floating mats of emergent macrophytes; (c) with freefloating macrophytes; (d) with submerged macrophytes; (e) with floating-leaved macrophytes. Based on Vymazal J (2001) Types of constructed wetlands for wastewater treatment: Their potential for nutrient removal. In: Vymazal J (ed.) Transformations of Nutrients in Natural and Constructed Wetlands, pp. 1-93. Leiden, The Netherlands: Backhuys Publishers. converted to free nitrogen or nitrous oxide in the anoxic zones by denitrifying bacteria. Volatilization is likely as both plankton and periphyton algae grow in FWS CWs and higher pH values during the day may be favorable for ammonia loss. FWS CWs provide sustainable removal of phosphorus, but at relatively slow rates. Phosphorus removal in FWS systems occurs from adsorption, absorp tion, complexation, and precipitation. However, precipitation with Al, Fe, and Ca ions is limited by little contact between water column and the soil. Substantial amounts of nitrogen and phosphorus may be stored in the peat/litter compartment. Algal and microbial uptake may be high but this retention is a short term process and nutrients are washed out from the detritus back to the water. Macrophyte uptake as a removal mechanism in FWS CWs is restricted by the fact that vegetation is not regularly harvested. Also, the amount of N and P seques tered in aboveground biomass is usually quite low as compared to inflow loading (usually <10%). The only exception are CWs with free floating macrophytes where harvesting is necessary for a proper function of the system.